You can create a block without any usual settings through Clipboard Copy & Paste. 1. Select objects to define block. 4. Specify insertion point of block. AutoCAD automatically generates block’s name. Replacing one block with another might not be a problem, but to replace several equal blocks one at a time with the same block, might slow you down. Express tools offer you a quicker way to do this. All blocks with the same name will be replaced with another block. Blockreplace command replaces all blocks with the same name with another type of block. But what if you want to replace only half of them, and there are many. Unfortunately there is no single command to do this, but a combination off to known commands might do the trick. To shortly describe; you transfer blocks you want to replace to a new drawing, rename them and transfer them back to the main drawing. You will have the same blocks with two different names. Use Blockreplace to replace the named blocks you like. 1. Select blocks to be replaced. 3. Open a new drawing. 7. Rename transferred named block. 9. Open the main drawing. 12. 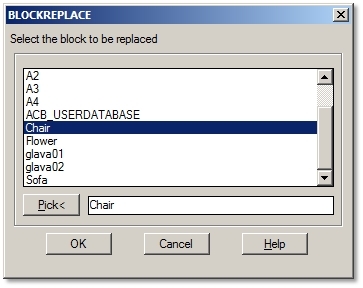 Replace transferred named block with another named block. You don’t need to explode a block just to copy some of its objects. Just use another useful Express tool; copy nested block objects as you would copy single objects. 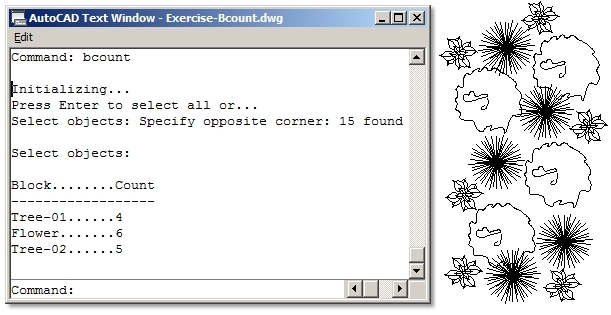 Type BCOUNT and select objects to list and count all block with the same name. When exploding attributes, its text explodes to tags that defined it. If you want to keep the text values, explode attributes using BURST command. When you want to change tag values in several of the same attributed blocks in your drawing, you will be faster, if you use GATTE command rather than changing each one separately. 2. Select attribute you want to modify. 3. Enter new text value. 4. Program automatically counts all of the same attributed blocks. Confirm with Yes to change new text in all of them or No to select them yourself.